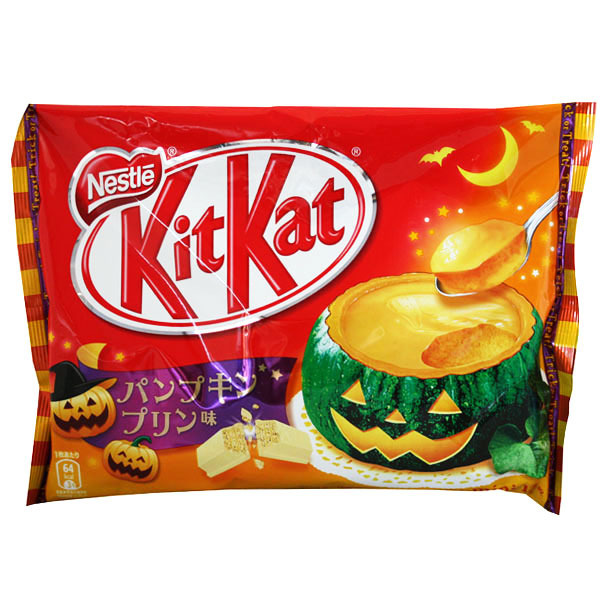 We’ll say it again, the Bakeable Pumpkin Pudding KitKat! We think the folk at Nestle Japan may have been sampling some pretty strong wasabi with their sushi that day, but whatever the thought process, we love the result! These very special KitKats are vibrant in colour. Already delicious, they totally come alive when baked! White chocolate flavoured with luxurious pumpkin pudding becomes crumbly, emitting a gorgeous aroma like baking cookies. And the taste? Sensational! Don’t be put off by the menacing pumpkin grimacing on the packaging; Bakeable Pumpkin Pudding KitKats can be rustled up at any time of the year, not just Halloween…. excuse us whilst we pop in another batch! These KitKats are available in full size share packs and individual selections! From wasabi to strawberry, raspberry to matcha, Japan Centre has all the zany KitKats you could need! Posted in Food and tagged christmas, halloween, japan, Japanese confectionery, Japanese KitKat, KitKat. Bookmark the permalink.